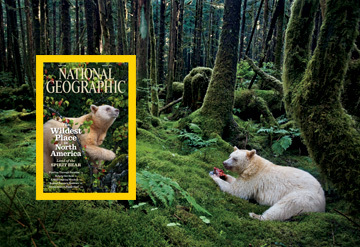 The August 2011 issue of National Geographic will feature the Kermode Bear and the Spirit Bear wilderness on it’s cover. This is thanks to the work of the makers of the movie spOILed who facilitated a visit by members of the International League of Conservation Photographers to the wilderness area on BC’s coast. spOILed follows the photographers as they work to capture the most compelling images of the forest and streams, salmon and bears. The main article, Pipeline Through Paradise, is about the Gitga’at people of Hartley Bay and their response to the sinking of the Queen of the North BC Ferry. “The accident taught them two lessons, they say. No matter how safe the ship, the most mundane human error can sink it. And when disaster strikes, they alone will be left to clean up the mess. Look out for this issue of National Geographic in August and let your friends know about it!